Today’s post is an homage to that most unjustly maligned group, mother-in-laws. As exemplified by today’s post, they are, by and large, a fine and noble set. I found today’s cocktail while perusing Chuck Taggart‘s GumboPages.com (credit given, lest I be ” étoufféed and served to Dr. Lecter, with a nice Chianti.”). This cocktail piqued my interest both by the high praised lavished and by the great backstory. He does a fantastic job chronicling the tale, and you should definitely go read it. No, seriously, go read it (and then skip the next hackneyed paragraph I’m going to write). A brief synopsis is Brooks Baldwin contacted him saying he had a recipe from his grandmother, one Mrs. Monte M. Lemann that she in turn had inherited it from her mother-in-law, Mrs. Lucien E. Lyons apparently just before the first World War. Apparently the drink had no name but was made in quart quantities and kept on hand a pretty decanter. After a bit of research and consultation with cocktail historian, Ted Haigh, it was decided that, though it bore a resemblance to other cocktails, including a Zazerac and Brooklyn, it was it’s own cocktail and should be named as such, hence it was christened, the Mother-in-Law Cocktail. He leads off his story with “I hope that this little experience will spark a renaissance in its imbibition.” I sincerely hope this as well. 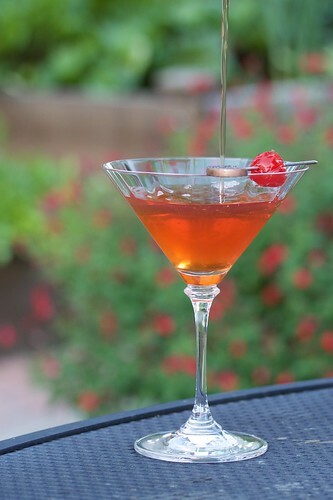 Below is (verbatim) his slightly modified recipe (replace the candy pink Maraschino syrup with Marachino liqueur). Combine ingredients thoroughly and pour into a clean one-quart bottle. To serve, pour three ounces into a cocktail shaker with cracked ice. Stir for no less than thirty seconds, then strain into a cocktail glass. 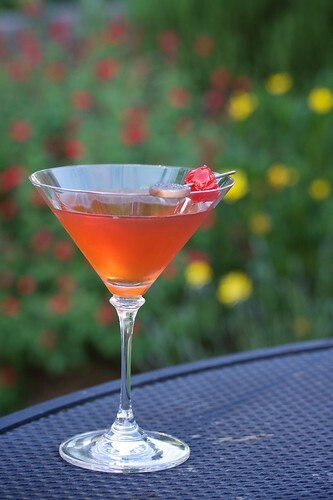 Garnish with a stemless cherry. I have to confess that, despite the lofty praise lavished on this drink, I used his single drink recipe in making today’s potations. The Mother-in-Law cocktail is as good as suggested, so I do not include the meager single drink recipe here (your can go to the GumboPages if you must). Hence forth, I will be keeping a decanter on hand for visitors of Nuestra Casa.